The “replication crisis” describes recent difficulties in replicating studies in various scientific fields, most notably psychology. The available evidence primarily documents replication failures for group research designs. However, we argue that contingencies of publication bias that led to the “replication crisis” also operate on applied behavior analysis (ABA) researchers who use single-case research designs (SCRD). This bias strongly favors publication of SCRD studies that show strong experimental effect, and disfavors publication of studies that show less robust effect. The resulting research literature may unjustifiably inflate confidence about intervention effects, limit researchers’ ability to delineate intervention boundary conditions, and diminish the credibility of our science. To counter problems of publication bias in ABA, we recommend that journals that publish SCRD research establish journal standards for publication of noneffect studies; that our research community adopt open sharing of SCRD protocols and data; and that members of our community routinely publish systematic literature reviews that include gray (i.e., unpublished) research. Gelman, A., & Fung, K. (2016). The power of the “Power Pose.” Slate Magazine. Retrieved January 20, 2019, from http://www.slate.com/articles/health_and_science/science/2016/01/amy_cuddy_s_power_pose_research_is_the_latest_example_of_scientific_overreach.html. Gilroy, S. P., Kaplan, B. A., Reed, D. D., Koffarnus, M. N., & Hantula, D. A. (2018). The demand curve analyzer: Behavioral economic software for applied research. Journal of the Experimental Analysis of Behavior. https://doi.org/10.1002/jeab.479. Hales, A. H., Wesselmann, E. D., & Hilgard, J. (2018). Improving psychological science through transparency and openness: An overview. 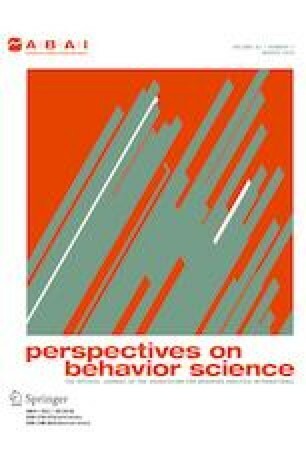 Perspectives on Behavior Science. https://doi.org/10.1007/s40614-018-00186-8. Jamshidi, L., Heyvaert, M., Declercq, L., Fernández-Castilla, B., Ferron, J. M., Moeyaert, M., et al. (2017). Methodological quality of meta-analyses of single-case experimental studies. Research in Developmental Disabilities. Advance online publication. https://doi.org/10.1016/j.ridd.2017.12.016. Kaplan, B. A., Gilroy, S. P., Reed, D. D., Koffarnus, M. N., & Hursh, S. R. (2018). The R package beezdemand: Behavioral economic easy demand. Perspectives on Behavior Science. https://doi.org/10.1007/s40614-018-00187-7. Perone, M. (2018). How I learned to stop worrying and love replication failures. Perspectives on Behavior Science. Advance online publication. https://doi.org/10.1007/s40614-018-0153-x.